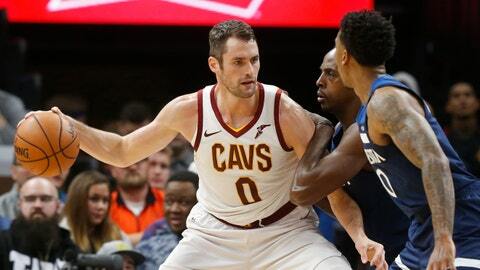 CLEVELAND (AP) — Cavaliers All-Star forward Kevin Love may not be back until sometime in 2019 following foot surgery. Love had an operation on Nov. 2 to relieve pain and pressure in his big left toe, which he injured in the club’s preseason opener. At the time, the team said Love would be out at least six weeks and his status would be updated in “approximately” when that period ended. On Tuesday, Love said in an interview on ESPN that he expects “to be back sometime after the new year.” Love said he’s going to in a restrictive boot for two more weeks. “There’s just no telling at this time with the weight-bearing injury what it is going to be like moving forward,” he said. Love’s loss was a devastating blow for the reeling and rebuilding Cavs, who are a league-worst 2-13 heading into Wednesday’s game against LeBron James and the Los Angeles Lakers.